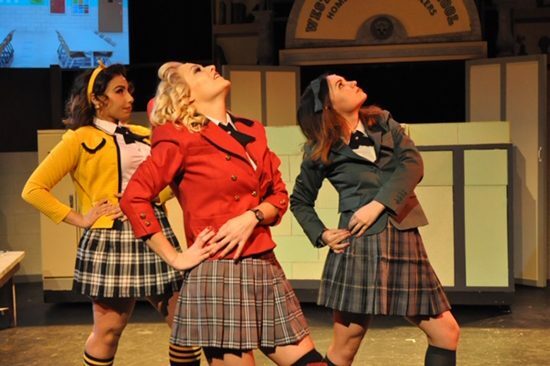 (from left): Hana Tawil as Heather Duke, Patricia Rupinen as Heather Chandler and Jennifer Rose as Heather Duke in ‘Heathers: The Musical.” Photo by Matthew Randall. Teenage angst has never been so much fun as in “Heathers: The Musical,” now in a fabulous new production at Dominion Stage. The twisted, tragicomic tale is a solid two hours of dancy music, sardonic humor and impressive performances. As a survival tactic, Veronica strikes a deal with the Queen Bee of Westerberg, Heather Chandler (Patricia Rupinen), the most popular girl in school – Veronica will use her forging abilities when Heather needs it if Heather will include Veronica in the popular clique, which includes Heather’s two minions, both also named Heather (Jennifer Rose and Hana Tawil); the trio’s solidarity is further telegraphed by a precise, color-coordinated dress code of blazers and skirts (costumes by Barbara Esquibel and Mark Hidalgo, hair design by Mary Francis Dini). Dominion’s production soars, in no small part due to its acting talent. Rebecca Cooley as Veronica comfortably embodies the character’s burgeoning confidence and inner conflict. What price will she pay for popularity? Will she sell out her friends? A lot of those conflicted feelings are also due to her developing romance with J.D. Dean (Matt Calvert), the black trenchcoat wearing new kid, introduced in a perfectly choreographed, cinematically slow-mo fight scene in which he pummels those bullying jocks. In a show of consistent sardonic humor, he has some of the driest lines: “Whatever your problem is, I bet it’s hard to pronounce,” he tells the jocks. Calvert, who was great in last season’s “The Hunchback of Notre Dame,” exudes a believable bad-boy magnetism, with a nihilistic attitude that becomes increasingly menacing as the production continues. That menace’s first victim is Heather Chandler, played with a wonderful, steely smugness by Patricia Rupinen. Dubbed a “mythic b—-” by Veronica, Rupinen is pitch perfect as the alpha mean girl. The toxic friendship comes to a head when Veronica refuses to sacrifice her friend Martha to a prank played by Heather’s friends; a trip to Heather’s house the next morning, originally meant to seek clemency from Heather, turns deadly when J.D. poisons Heather’s hangover cure, setting in motion a chaotic chain of events at Westerberg High. The oversized feelings of the show’s teenagers, and their dramatic deeds, lends the story to musical adaptation, and the production features plenty of high-energy numbers. “Big Fun,” a big ensemble piece set at the high school party is dance-in-your seat fun. Showcasing great vocal talent, the numbers are also boosted by live music. The ensemble pieces keep the energy high through a fast-paced first half, that darkens towards the second half as J.D. continues his murder spree. “My teenage angst bullsh- – has a body count,” Veronica exclaims, realizing how far the situation has spiraled. Despite the dark turn, or probably because of it, the second half remains just as enjoyable, and features the best songs of the show. I won’t spoil the story behind the song “My Dead Gay Son,” but it was definitely a favorite moment in the production. Tensions built throughout the show ultimately end in a literal bang. Like many high school stories, things work out for the good guys; but unlike my high school (and maybe yours, too), this show was a real treat. Advisory: The performance contains gunshot sound elements, adult language/mature situations and the use of fog effects. “Heathers: The Musical” runs through Jan. 26 at Gunston Theatre Two, 2700 S Lang St, Arlington, VA 22206. For tickets or more information, click here.